Hello everyone! 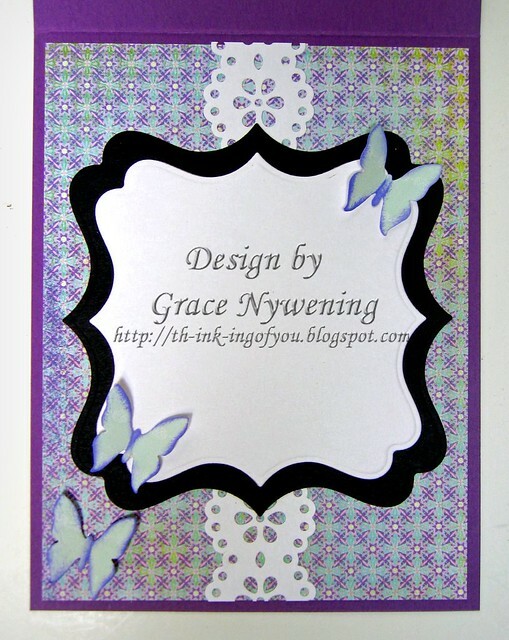 I made this card with the newly released Layers of Color Embroidered Butterfly cling art stamp. I colored it with Pebbles Pearlescent Chalks. I framed it with the newly released Rose Blossom Frame cling art stamp, also colored with chalks. This frame is custom made to match the Spellbinder's Label Sixteen. I just love these new frames!!! 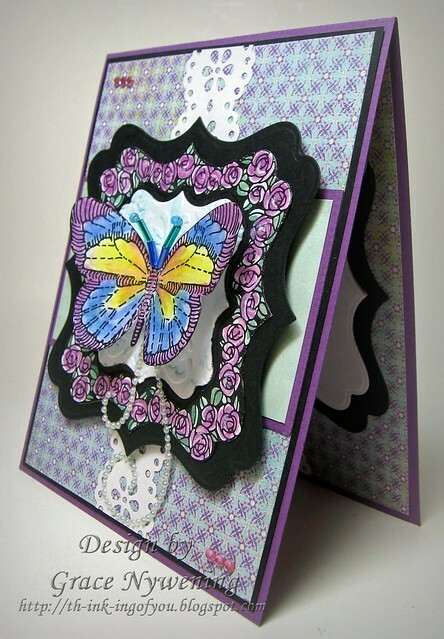 We're so excited that Layers of Color is now a Spellbinder's Preferred Stamp Company! These Spellbinder's Labels will be available from the Layers of Color Store. The antennae are made with wire and little beads. I wanted to play in the Cardvaarks challenge this week, which was to decorate the inside of the card, so that's what I did! Here is the inside, ready for my message when I send this. Paper: Bazzill (base), Basic Black, Memory Box Enchanted and Spearmint, Gina K Pure Luxury White layering weight. Accessories: Spellbinder's Label Sixteen, Cuttlebug Cassie's Brocade Embossing Folder, MS Punch, Recollections Bling, ZVA Creative Pearl Flourishes, Asstd beads from my stash for the antennae. I also made this for A Spoon Full of sugar to use die cuts and/or punches, and Creative Card Crew - Let's Punch it. Thanks so much for looking! Have a blessed week and please be sure to come back Monday for the Our Daily Bread designs November Release Blog Hop! Beautiful card, Grace! I love the colors, the design and as always, you've done a marvelous job! comes up all of the time. I LOVE (in a materialistic way) the floral border. I would love even just that! But then you add the butterfly, and embossed sky and the pearls and lace. Stunning! The inside is fabulous also. This would make a wonderful belated birthday card for someone who...let's just say...turned 45 last week! And, thinks you are wonderful! I'm just playing! Use it in a way that fills your heart and their heart with happiness! What a wonderful card Grace,I love the image and the colours. Literally gorgeous Grace!! Love the colors, the design, just all of it!!! Very very pretty Grace, the butterfly is just gorgeous. I like the way those stamps fit the frame. Hmmm, will have to check into that. This is gorgeous Grace!! I just love your colors and the stunning butterfly and design!! Gorgeous inside and out GF!! This is so pretty Grace. I love the way you used your colors on this card. 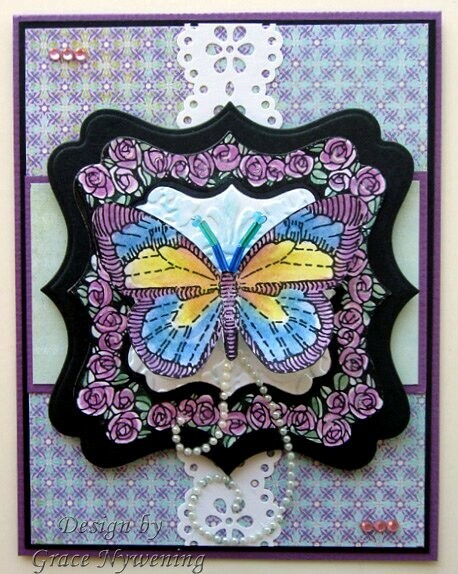 The lace border is perfect for this card. See you next weekend..can't wait. WOW, Grace, is this ever pretty....you have used such beautiful colors and I love how you colored the gorgeous butterfly and frame!!! !